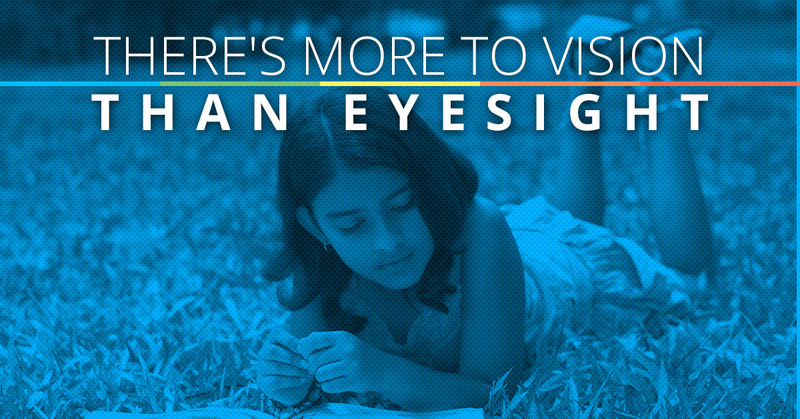 People often use the terms “vision” and “eyesight” interchangeably, but there’s more to vision than eyesight. When most people think of great vision, they automatically think of 20/20 eyesight. However, vision also has to do with the way that your eyes focus, interpret information, perceive depth and so much more, and simplifying vision to mean just eyesight can have major ramifications for both children and adults alike, particularly on a child’s ability to learn. Many visual skills are required for successful learning. Accommodation – The ability to focus and refocus the eyes from near to far. A great example of this is the ability to efficiently and effectively focus on the chalkboard behind the teacher and then again on the textbook. Motility – The ability to follow a moving object with the eyes smoothly and accurately. Saccades – The ability to quickly and accurate move the eyes from one point to another. Convergence/Divergences – The ability to focus both eyes in and out on an object. Stereopsis – The ability of the brain to combine the images gathered from each eye into one, three-dimensional picture — otherwise known as depth perception. Visual Motor Integration – The ability to coordinate visual information into motor skills. Form Discrimination – The ability to pick out differences in similarities in objects, such as shape, size, pattern, position, color and form. Figure Ground – The ability to locate a figure against a busy background. Visual Closure – The ability to identify an object or symbol without seeing the entire thing. Form Constancy – The ability to manipulate and recognize visual figures when they are in a different form or orientation. Visual Memory – The ability to remember words and sequences of words, and recognize them quickly when seen again in print. Don’t let a visual problem hold your child back. 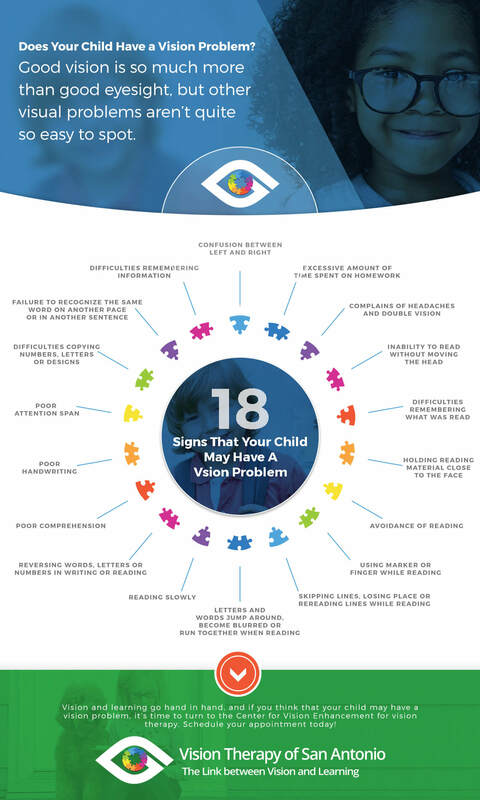 Vision is so important for your child’s success in school and in life, and if you think that your child may have a visual problem unrelated to eyesight that is holding them back, turn to Vision Therapy Of San Antonio today. We offer vision therapy in San Antonio, and we are dedicated to helping your child learn to use their vision more efficiently and effectively. Contact us today to learn more.